North Carolina’s population grew to an estimated 10.3 million people as of July 1, 2017, according to new estimates from the U.S. Census Bureau. From July 1, 2016 to July 1, 2017, the state’s population increased by nearly 117,000 individuals. This number surpassed last year’s total population increase and marks the largest single year increase in the state’s population since 2010. Among the states, North Carolina had the 5th largest numeric increase since 2016. Only Texas (400K), Florida (328K), California (240K), and Washington (125K) gained more residents over the past year. With a growth rate of 1.1% since 2016, North Carolina continues to grow faster than the national average (0.7%), although it is not among the fastest-growing states. Between 2016-17, North Carolina had the 12th highest growth rate. The three fastest-growing states were western mountain states: Idaho (2.2%), Nevada (2%), and Utah (1.9%). Since 2010, North Carolina’s population has grown by more than 737,000 residents, an increase of 7.7%. Sixty-four percent of this growth was due to net in-migration. In the most recent year, North Carolina received an estimated 86,200 net in-migrants (74% of total population growth). This was the largest year of in-migration for the state since the 2010 Census and was more in-migrants than received by any other state except for Florida, Texas, or Washington. Most of these in-migrants were domestic migrants (66K), meaning that they moved to North Carolina from other states. North Carolina was ranked 4th among the states for total number of net in-migrants from 2016-17 but 3rd for domestic migrants (after Florida and Texas). The state receives relatively fewer international migrants (this includes immigrants and citizens returning to the U.S. from abroad, such as returning military personnel). From 2016-17, North Carolina received an estimated 20,000 international migrants, the 15th largest amount of any state. 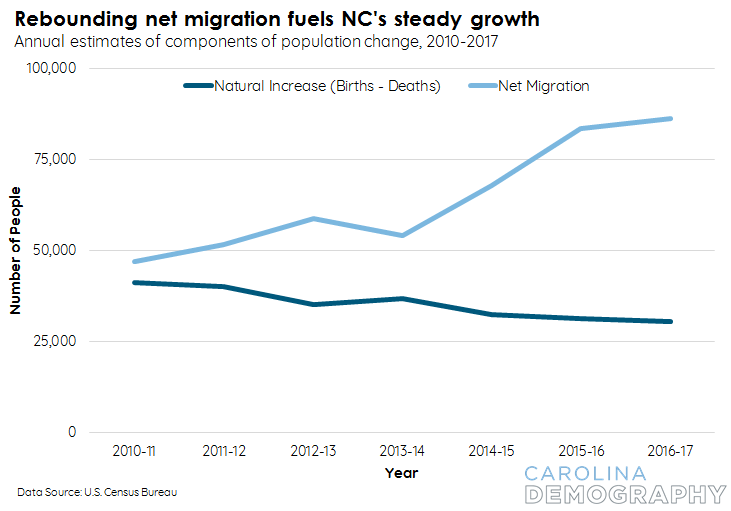 These new estimates are consistent with the latest population projections from the State Demographer that project that North Carolina will have 10.6 million residents by 2020. This entry was posted in Carolina Demographics and tagged natural increase, net migration, population estimates, state demographer, states, U.S. Census Bureau. Bookmark the permalink.